$15/person or $20/2 people (bring a friend) Mention code “Costa Mesa Chamber” for individuals to save $5! Come learn life saving techniques in a fun, safe, and clean learning environment with the leading professionals of the field! 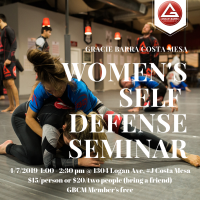 Bring a friend and see first hand the benefits of learning self defense!